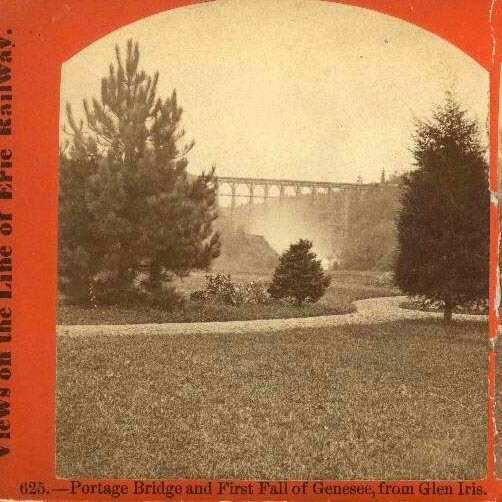 "625.-Portage Bridge and First Fall of Genesee, from Glen Iris." 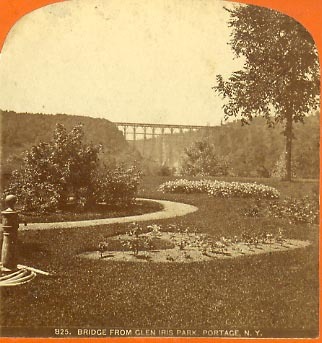 The Portage Wooden Bridge hides behind the mists of the Upper Fall in the stereo taken from the South Lawn of the Glen Iris Estate. This portion of the lawn was often called the "Glen Iris Park" and was a favorite spot for tourists and photographers alike. Note the gravel path that was probably part of William Webster's design. Another view from the South Lawn is found below. "825. Bridge from Glen Iris Park, Portage NY"
This view "from the Park" highlights the landscaping of the Grounds, including the sculptured flower gardens. Note the hose and water spigot to the left. Also see our Glimpse of the Glen Iris.